44 BOO (44 Bootis). 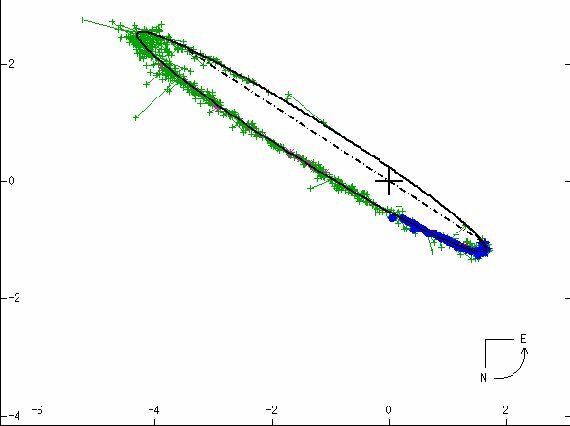 Just when you think that star systems can get no odder, along comes something like 44 Bootis, known best by its Flamsteed number and less romantically as HR 5618 in the Bright Star Catalogue, qualifying at fifth magnitude (4.81). Nothing about the star is very secure. At first look, a magnitude 5.2 solar type class G2 dwarf (but given as warm as F7) is in mutual orbit with a magnitude 6.10 K2 (G? K4?) dwarf with a period of 209.8 years, the two never more than a few tenths of a second of arc apart, making them quite difficult to separate. Yet they have been split since William Herschel first did it in 1781, referring to the binary as "a miniature of Castor." In the nineteenth century, Smythe and Chambers saw the two as "pale white" and "lucid grey," and called it "a remarkable and highly interesting star." They should only have known! Given a distance of 41 light years (give or take just one), the two orbit at an average separation of 46 Astronomical Units, a substantial eccentricity taking them as far apart as 69 AU and as close as 22. Kepler's laws give a total mass to the system of 2.2 Suns. Written byJim Kaler 8/01/14. Return to STARS.